Site-specific, live surveillance feed of The Ossificatorium, organized in collaboration with FOFA Gallery. Special thanks to Jennifer Dorner and Stephan Schulz. Recorded for future use. Installed in the FOFA Gallery administration office/ reception area. 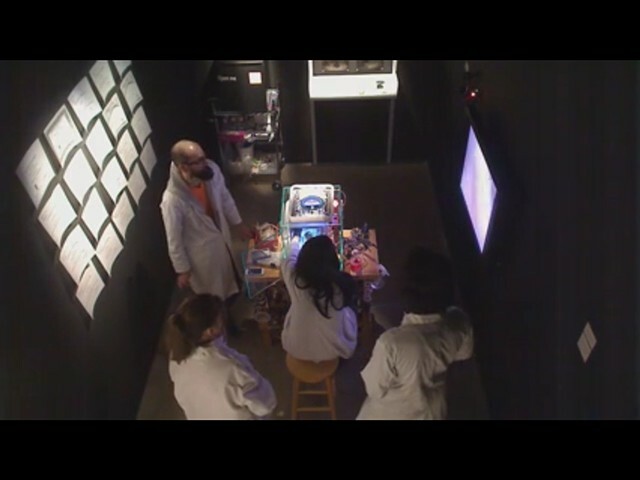 * This video still shows the artist engaged with gallery visitors in a demonstrative performance. Audience interference/play with Incubatrix Neith could kill the artwork. Aside from this very real need to monitor (survey) activities within the pop-up laboratory, Field Investigation is also an ethnographic experiment. This ethnographic surveillance nods to the work presented by Tristan Matheson in the Biomateria + Contagious Matters exhibition while also referring to the act of monitoring micro-ecologies as one of the prominent activities of tissue culture work. In this installation, upon entering the gallery, visitors are presented with a live video feed on a monitor, of activities not yet understandable. People in lab coats appear to be moving around a space containing an apparatus and workstation. The activity could be taking place anywhere, but is typically understood to happen in a place where members of the public do not have access. Once visitors enter the gallery and find their way to the lab, don lab coats and begin exploring the contents presented to them, they will recognize that just as they were voyeurs at the gallery entrance, they are now the ‘specimens’ being watched.